During the month of December, we are learning about how different people from different cultures celebrate holidays. We are focusing on Christmas, Hanukkah, Kwanzaa and Las Posadas. We have learned that all four holidays have special food, special lights, gifts and are all important times for families. We made mkekkas (woven mats) and sweet potato pie like people who celebrate Kwanzaa, we made dreidels (spinning tops) and latkes (potato pancakes) like people who celebrate Hanukkah, we made gingerbread man cookies and decorated a Christmas tree like people who celebrate Christmas and we are going to have tamales and hit a pinata like people who celebrate Las Posadas. 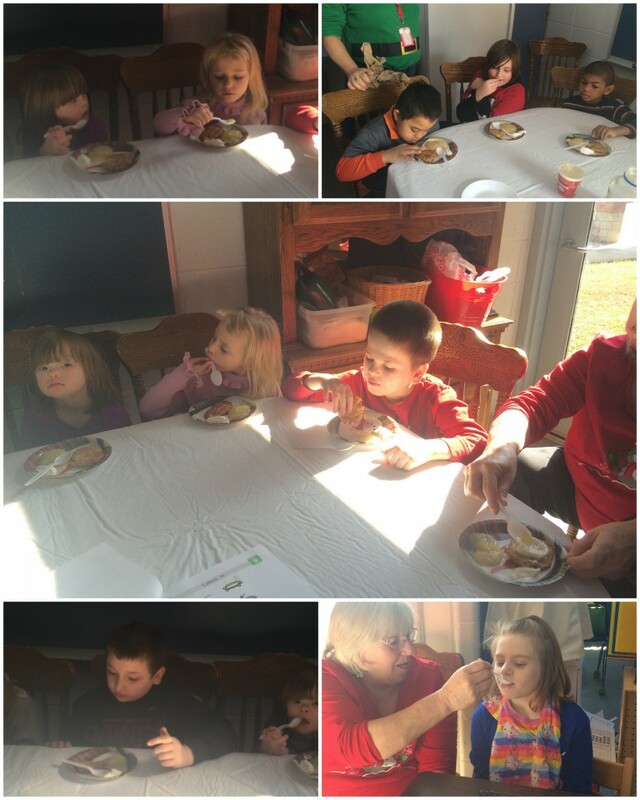 Here we are eating the latkes we made – yum! This entry was posted in Uncategorized by Mrs. Mays. Bookmark the permalink. y’all have spent a lot of time in the kitchen. I can tell the students really enjoy these activities.